This is a fine model of a hunting Setter frozen on point by the listed Austrian artist Hans Muller. The bronze is finished in a rich brown patina and is mounted on a 9" by 4 1/2" by 1" thick highly figured marble base which has a repaired crack that is barely visible. It was cast around the turn of the century by a Vienna foundry, signed H. Muller and stamped Austria. 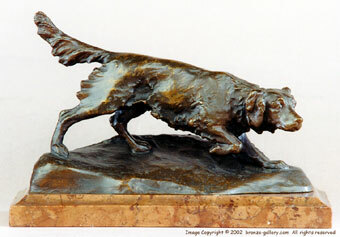 Many of Hans Muller's bronzes including a model of this sculpture are in the Simu Museum in Bucharest.